October is the month of half term activities, Halloween and everything in between! Autumn may be upon us and the leaves are falling but the sun is still shining and there is still plenty to see and do in Cornwall. Falmouth is a busy place in October with its Oyster Festival from the 13th to 16th and Beer Festival from 21st to 22nd. The Fal River Autumn Walking Festival takes place for two weeks from the 21st October, encompassing the very best of the Fal River. The nearby Roseland Festival kicks off on the 15th October with a series of music, drama, film and literacy events. Elsewhere, there is a packed schedule at the Eden Project including the return of the ice rink for half term and spooky activities for “Halloween”. Nearby, Fowey has their Cornish Craft Fair on the 15th and there is still plenty of surf action with the Extreme Academy BSUPA Championships on the 15th and 16th October at Watergate Bay near Newquay. Beachcombers is situated just 200 yards from the fantastic sandy beach at Watergate bay. These superb apartments are located just a few moments walk from Jamie Oliver's restaurant Fifteen, the Extreme Academy and the beach which stretches to 2 miles at low tide. Budock Cottage sleeps up to 6 people on a small developement of converted barns, with a shared outdoor heated pool. 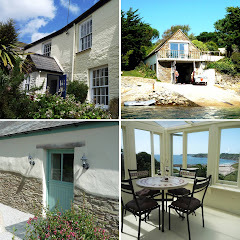 Situated on the South Cornish Coast, a short drive from beautiful beaches and the seafaring town of Falmouth. The complex also benefits from a large garden! Embarking on its fifteenth year, Falmouth Oyster Festival celebrates the start of the oyster dredging season, the diversity and quality of Cornish Seafood and in particular, one of the last remaining traditional oyster fisheries, dredging by sail and hand punt. 13th-16th October, Events Square, Falmouth. Come along and experience a broad range of 150 local and national ales. Plus: Real Lagers, Real Ciders & Perries. With hot & cold food, live entertainment, pub games and free soft drinks for drivers. 21st - 22nd October, Princess Pavilion, Falmouth. The Fal River Autumn Walking Festival encompasses the very best of the Fal River. The walks will encounter historical points of interest, meander along coast paths, pass through areas of outstanding natural beauty and world heritage sites. The following properties still have weeks available for October! Set amidst the rolling countryside close to the upper reaches of the River Fal, this immaculately presented single storey converted barn is perfect for those looking for peace & tranquility, yet only 10 mins from the nearest beach and within easy reach of both St Mawes & Portscatho. Located in the heart of the famous Cornish harbour village of Mevagissey, this charming three storey cottage is just a few minutes walk to the picturesque harbour with its selection of pubs and restaurants. Don't forget to follow us on Facebook and Twitter to keep up to date with all our new properties and special offers.